Movie Review: Asif Kapadia’s documentary “Amy” about the British singer and songwriter Amy Winehouse is pretty absorbing but not so intense as his 2010’s “Senna” about the Brazilian F1 pilot, Ayrton Senna. In its first part, the film chronicles the ascension of the young artist, so profuse in the unique, eclectic pop-jazz that also finds its ground on soul, rhythm and blues, and reggae. Mr. Kapadia assembles home footage and audio voice recordings of her friends and family to describe how Amy gave the big jump from an unknown teen girl of Southgate, London, to one of the most appreciated singers/composers of our times, attaining the desired fame that, as she predicted, would drive her mad. The second part maintains the methodology, focusing more on the troubles and fall of the vocal talent who reached the glory with only two albums. The ones who were so important in Amy’s life, gave their contribution to the film: from her weak mother, Janis, and opportunist father, Mitch, to her childhood friends, Lauren Gilbert and Juliette Ashby; from her first manager, Nick Shymansky, and her bodyguard, Andrew Morris, to several musicians and producers who accompanied her in studio and on tour. Mandatorily, Kapadia emphasized her problematic relationship with Blake Fielder, who would become her husband and partner on the consumption of heavy drugs. The situation rapidly went out of control and Amy died in 2011 at the age of 27, victim of alcohol poisoning, alone at her home in Camden, London. The film, thoroughly edited by Chris King, comprehends concerts, partnerships (featuring Tony Bennett), prizes, health problems (eating disorders and bulimia), substances abuse, media invasion, depression, unconditional love, and regret for letting friends behind or sorrow for sometimes having been abandoned by some of them. 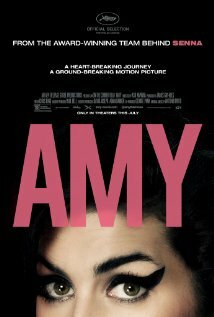 The narrative cohesion was laudable, but the film kind of loses some grip in the last third, in part because, at that time, Amy’s life didn’t have much more to offer than failed rehabs and sad relapses into addiction.